Is Psychoanalysis Relevant to Neuroscience? Do Split Brain Patients Have Two Minds? Does Hierarchical Predictive Coding Explain Perception? Does Artificial Intelligence Need More Innate Machinery? Do Replication Projects Cast Doubt on Many Published Studies in Psychology? Can Neuroscience Help Us Understand Art? Do Mirror Neurons Explain Anything? Do Psychology and Neuroscience Have Moral Implications? A “nature-nurture” debate is now taking place in the foundations of artificial intelligence. Advocates of deep learning, including Yann LeCun, hold that to create advanced artificial intelligence systems, general mechanisms for learning from the environment will play the most important role. Critics of deep learning, including Gary Marcus, hold that these systems will be limited unless they incorporate much more innate domain-specific machinery. 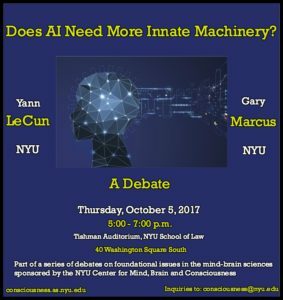 This debate parallels a long-standing debate in the cognitive sciences between nativists, who hold that the brain relies on a great deal of innate domain-specific machinery, and empiricists, who hold that it relies mainly on general mechanisms for learning. No registration is required. Seating is first come, first served. A reception will follow the event. 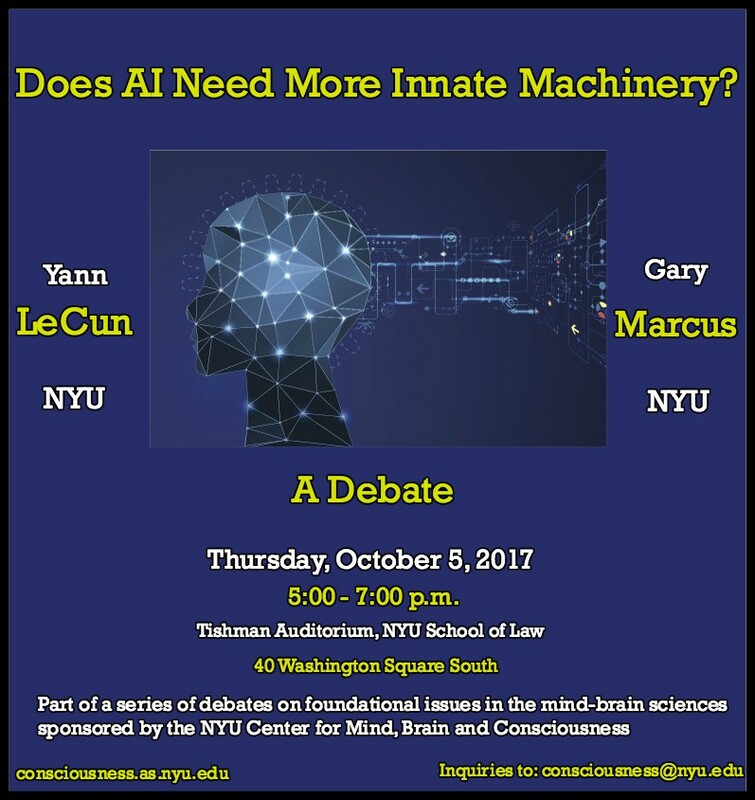 This event is part of a series of debates on foundational issues in the mind-brain sciences sponsored by the NYU Center for Mind, Brain, and Consciousness, directed by Ned Block and David Chalmers.